. 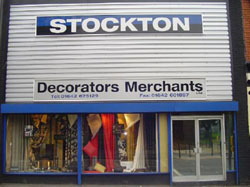 :Stockton Decorators Merchants Ltd - Stockton branch page :. You can find us situated just west of the main high street in Stockton on Tees. Stockton Decorators Merchants Ltd have been supplying professional decorators, contractors, local authorities and enthusiastic diyer's with the best quality branded paints and decorating sundries for nearly 40 years. We have aquired a loyal customer base over this period by providing a professional and friendly service and offering helpful advice whether your choosing wallpapers and fabrics, paint colours or just requiring technical product information. Over 500 wallpaper and fabric pattern books are available to view and can be borrowed on a loan system for up to 5 days free of charge. Paint colour sample cards are provided free of charge and for customers requiring a specific shade, our 'colourzone spectrophotometer' will scan and generate an individual paint recipe to accurately recreate the colour required.